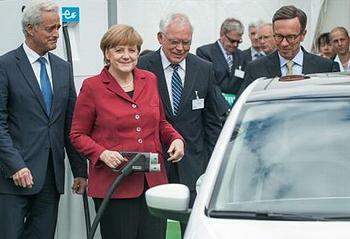 BERLIN, Germany, May 28, 2013 (ENS) – Chancellor Angela Merkel restated her goal of putting one million electric vehicles on German roads by 2020 at a two-day conference on electric mobility staged by the federal government that opened Monday in Berlin. “Electric mobility requires extensive cooperation, across both sectoral and national boundaries, if we are to reduce the climate change impact of mobility in as much of the world as possible,” said Merkel. More than 900 representatives from industry, academia, civil society and governments around the world attended the conference, entitled Electric Mobility Going Global. Delegates discussed both the potential of electric mobility and what it will take to stimulate the market. The German government is conducting an extensive research program in the field of electric mobility. By the end of this year, projects with funding totaling roughly 1.5 billion euros will have been launched. European Transport Commissioner Siim Kallas emphasized the need to harmonize charging technology across the 27 European Union Member States before potential buyers will embrace electric cars. “The number one problem is infrastructure,” Kallas said. He proposed that a minimum number of electric charging points be available in each EU country by 2020 and of these, at least 10 percent should be publicly accessible. “Consumers will only reach this market if they can buy at a reasonable price and if there is enough accessible infrastructure for the vehicles to run. Without it, this market will not succeed, despite the huge investments that have been made,” Kallas warned. It is not only the physical interface at charging or refueling points must be compatible, although currently there are numerous variations around Europe, there must be standardized ways to pay in all EU countries, said Kallas. “This is to avoid a situation where a car traveling, say, from France to the Czech Republic across Germany cannot do so simply because the sockets at national charging stations are not compatible or because there is no machine for processing a particular payment card,” he said. Of the EU countries, only France is expected to increase its charging infrastructure, with 4.4 million charging points planned by 2020. In the rest of the EU, only 600,000 points are likely to be deployed by then, Kallas said. For hydrogen fuel cell vehicles, he said, the EU needs a network to link existing fueling stations and those planned along the main road transport corridors that are compatible in all countries. 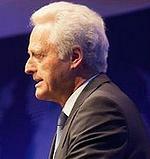 German Transport, Building and Urban Development Minister Dr. Peter Ramsauer said his country is “on the right track” as far as electric mobility is concerned, and Commissioner Kallas agreed that Germany is indeed on track to put a million electric vehicles on the road by 2020. Germany has some 43 million registered vehicles on the road today, but only 7,000 are electric cars and 65,000 are hybrids. In front of the Berliner Congress Center, delegates and members of the general public test drove a wide variety of electric cars: Audi A1 e-tron, BMW active E, Smart fortwo electric drive, Mercedes Benz Vito E-CELL, Ford Focus Electric, Opel Ampera, VW e-Golf, Mitsubishi i-MiEV, Peugeot iON, Renault Zoe, Toyota Prius PHEV, Volvo C30 Electric and Volvo V60 PHEV. And at an exhibition on the sidelines of the conference, these and other automakers presented their electric vehicles and showcased the latest developments in electric mobility.